Whether it's your first time buying a home or you've bought and sold property a dozen times before, teaming up with the right Sherwood Park REALTOR® is the critical first step in making a great experience. 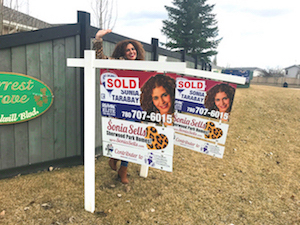 Sonia Tarabay puts her inner tiger to work for each and every one of her home­buying clients, delivering outstanding 5 Star Service every time. When you've got Sonia on your side, buying a home is easier, faster, and way more fun! REALTOR® & Mortgage Broker - This tiger is both a professional REALTOR® and a licensed mortgage broker, and she brings this combined expertise to every transaction. A rare combination of skills, Sonia is as at home talking about open, fixed­rate, closed, and variable mortgages as she is talking home values and house­hunting. A Friendly Tiger - Sonia is known as Sherwood Park's real estate "tiger" for good reason, but her client's know her best for her friendly nature, approachable personality, and 24/7 availability. Relationships are important to Sonia: When you work with her, you don't only get a great buying experience, you also make a life­long friend. On Your Side - Loyalty is important to Sonia, and she's always on your side throughout the entire home buying experience. She stands up for your best interests every time, whether it's during the house­hunt or at the negotiating table. You'll never feel pressured to make a snap decision, and she'll be the first to stand in front of anyone trying to push you around. She'll Make It Fun - Sonia believes buying real estate can be a great experience for everyone, and strives to make the entire process as enjoyable as possible. When you buy with Sonia get ready for a good time: There will be lots of laughter, smiles, and adventures along the way! Networking Master - Sonia is a people­person, and has a wide network of people to call on when additional expertise is needed. Whether you need a great real estate lawyer, a plumber, a home inspector, or a new local restaurant suggestion, Sonia always knows exactly who to call. Sherwood Park Real Estate Expert - While Sonia services the entire Edmonton area, she loves working, living and playing in Sherwood Park. She knows the Sherwood Park community like the back of her hand, and is always up to date on the latest new developments, feature events, and the best locally owned­ and ­operated businesses. If you're ready to learn more about buying Edmonton or Sherwood Park real estate with Sonia, call 780-707-6015 or send a message using the form. The Right Agent For Us! ﻿She was extremely professional, energetic with a fantastic bubbly personality. Sonia was also our Mortgage Professional and found us an excellent five year fixed rate! ﻿Her positive energy, professional nature, personable outlook, and fine tuned knowledge of the local market made our experience with her unforgettable.